What better way to ring in the new year than by getting married on December 31! A New Year’s Eve wedding can be romantic and fun, all your closest friends and family will be with you on your wedding day and to ring in the new year! But as with all wedding planning there are pros and cons to having a NYE wedding. Because it’s the holidays you know your friends and family can get the time off work to come to your wedding, however there might still be some who prefer to do their own thing on New Year’s and will turn down the RSVP, but that means those who do come are going to be very party hearty at your reception! You’ll be ringing in the new yer in style all dressed up in your gown, and there will be fireworks and sparklers to not only celebrate the new year, but give your wedding a sense of wonder. Best of all you’ll be able to buy your decorations at a discount if you buy them after Christmas. You might pay more for hotel rooms and catering because it’s a holiday. If you don’t plan more than a year in advanced you mght have trouble finding a venue. If your venue is too far out of the way then your guests might have trouble travelling to your destination. Getting a taxi on New Year’s can be an absolute nightmare. If the idea of a New Year’s Eve wedding appeals to you, here are some tips to help you start planning your big day. You will need to vet hotels early, so if you know that December 31st is the day, then you need to talk to hotels early to compare prices and what that price comes with. After all you’re guaranteeing the hotel will have guests, and that means business for them. Make a list of what each hotel is willing to do for you and your guests, then look at the price, and get those quotes in writing so you know they can’t try to change it afterward. When you’ve decided which hotel is the one for you, you can plan the other specifics. Find a church that is willing to do a mid-week wedding, because New Year’s Eve isn’t always going to fall on a Saturday. Make sure the church is relatively close to the hotel. 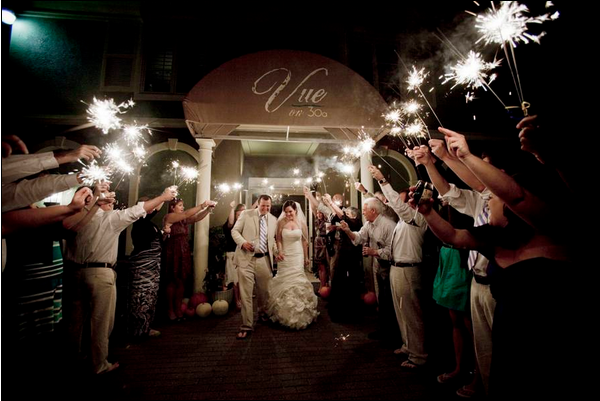 Ask aout their policy on sparklers and confetti, are you going to be able to throw some star shaped confetti or walk through sparklers? Now you’ve got to find a DJ and photographer/videographer who are willing to party on NYE wth you and your crew, it would be best if you offer them a plated dinner at the reception and a tip for agreeing to do your wedding on New Year’s. Next find some gorgeous dresses for your brides maids to wear! The men can wear black ties for this affair, making everything feel elegant and opulent. You can wear something over the top because it’s a NYE wedding, so sparkles and jewels are more than appropriate for this occassion. Let your imagination guide you! You should send the invitations at least three months in advance if you do plan a NYE wedding, this will give your guests plenty of time to either make arrangements to come, or let you know whether they are going to make it or not. Should a NYE wedding peak your interest, just Google New Year’s Eve weddings and see what others have done, you can take your wedding to a whole new height if you’re willing to step outside the box.